For this alert, though, let us set aside the death and life realities of killer beech bark disease and the Boggsian itty-bitty bite/peench story of the beech blight (boogie-woogie) aphids (http://bygl.osu.edu/node/883). Let us look at several leaf problems from the perspective of proper diagnostics. Let us distinguish Beech Leaf Disease, a major emerging concern featuring extreme leaf-banding as seen in the lead photo, from more trivial leaf problems, including: erineum patches caused by eriophyid mites; then a common aphid causing some discoloration and leaf-banding; and beech anthracnose. First, let’s elaborate on Beech Leaf Disease. In addition to the unusual leaf-banding, there is leaf shriveling, thickness of leaves, and most disconcerting - thinning of canopies, including large trees, over the years since this was identified by John Pogacnik of Lake Metro Parks and others. Observers in parts of Pennsylvania and Ontario also report these symptoms. 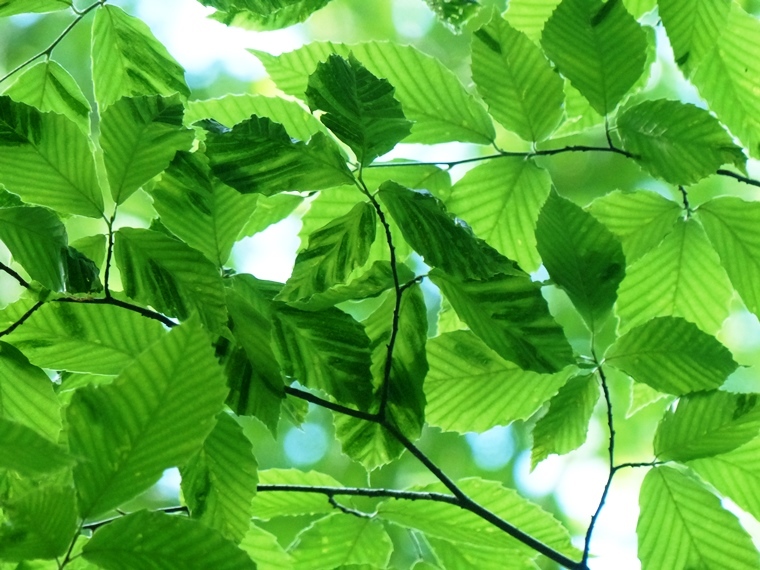 Beech Leaf Disease is emerging as a serious problem. Do not confuse Beech Leaf Disease with erineum patch on beech, caused by eriophyid mites in the genus Acari. Eriophyid mites are a group of mostly host-specific carrot-shaped, microscopic mites. Eriophyid mites cause maple bladder galls and maple spindle galls, rust and stunt mites on conifers, distorted growth on coneflower, and erineum patches on beech, birch and maple, and many other problems, again both serious and not significant. Eriophyid mites also may transmit plant pathogens, such as the rose rosette virus. On beech, the erineum patch problem caused by Acari sp. eriophyid mites is not serious, but as you can see below, could easily be seen by observers as “banding”. Another fooler is what I would describe as garden-variety aphid feeding and damage on beech (though I do not know the species of aphid), evident from some leaf yellowing on the upper leaf surface, again easy to imagine as described to be “banding”. The tell-tale difference here, though, is the rolling of leaves and sometimes presence of white cast skins of these aphids. It is important to remember that when you hear that Beech Leaf Disease was observed somewhere, say in central or southern Ohio, or even my neck-of-the woods in Wayne County, it may be that the observer is describing something other than Beech Leaf Disease. I am not doing surveys, but am in Johnson Woods near Orrville in Wayne County ever week, and it is home to a multitude of American beeches. I have not seen Beech Leaf Disease there. Fortunately Connie Hausman of Cleveland Metroparks and John Pogacnik of Lake Metroparks are doing extensive surveys. Then, there is something a little easier to differentiate, beech anthracnose, seen below. Symptoms include brownish blotching of foliage, especially along major leaf veins. So, where are we at with Beech Leaf Disease? We are learning that it does occur, in addition to woodland American beeches, at least to some extent, on European (Fagus sylvatica) and Asian (Fagus orientalis) beeches in northeast Ohio growing areas. We know that we don’t know what causes it or that if it is caused by a virus or other pathogen what its vectors might be, if any. We do not know how serious it will become or how much more it will spread from one area to others. We do know that it is not easy to identify its cause; common suspects are not responsible. We do know that there is hope to identify its cause now that OSU forest pathologist Enrico Bonello and his graduate student Carrie Ewing are on the case and that preliminary grants are fueling initial research. We do know that Enrico and John and others will be speaking about this problem at the Why Trees Matter Forum in Wooster on October 18 and that we will have some preliminary diagnostics (images, no samples) at Wooster at the 84th Ohio Plant Diagnostic Workshop on September 8.